MERCED, CA (July 25, 2016) – Pass the Handle came a week early this year at Centurion and Supreme Boats. These Correct Craft Companies combined Pass the Handle day with a Weekend of Giving on July 16, 2016. 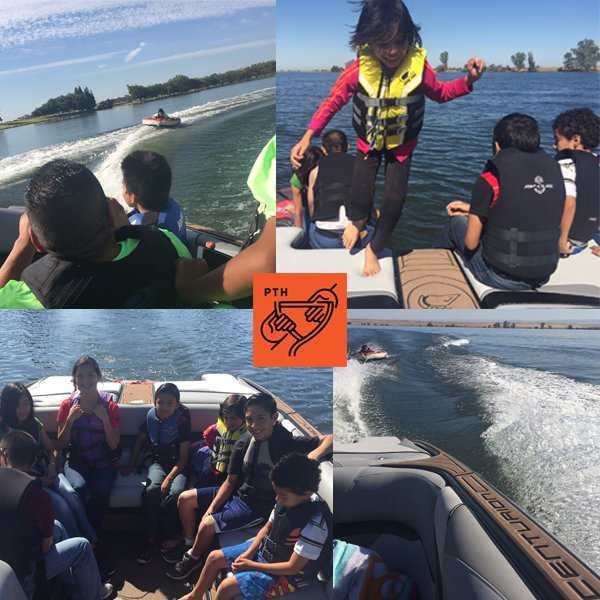 In addition to a canned food drive and Lake Yosemite clean-up, Centurion and Supreme chose to give the fun of towed water sports to some extremely deserving individuals. Employees Manual Ayala and Jose Gonzalez Mora as well as their children were surprised with first-time rides in and behind the boats these two dads have been building for many years. Originally Centurion and Supreme Boats had planned to Pass the Handle to a local less fortunate family on the Weekend of Giving. While recruiting for Lake Yosemite trash clean-up help, they realized there were some deserving families much closer to home. At the company picnic Ayala mentioned that he had never been in a Centurion or a Supreme boat on the water. After building these boats for more than 22 years, the leadership team felt it was time they Pass the Handle internally to employees like Manual. Ayala has been building Centurion and Supreme Boats since 1994. He works in the Upholstery Department hand covering Centurion and Supreme interior pieces. He is a single dad with 4 boys and 1 grandson. He enjoys razing his boys, playing soccer, going fishing and taking his kids to soccer. Manual calls himself a “soccer dad”. He has seen nothing but positive change at Centurion and Supreme Boats since becoming a Correct Craft Company. About Centurion Boats: Centurion Boats has always been based on innovation, but exciting new product, leadership and Correct Craft company culture are sparking a re-imagination of the Centurion brand. Water sports boaters are now choosing Centurion boats for next generation versatile performance, ambitious design and inspired craftsmanship. Thanks to this progression, Centurion Boats is experiencing their fastest market share growth in history. Re-imagine life in a Centurion boat. To learn more about Centurion Boats and its complete product line, visit www.centurionboats.com.